Right around the coast of France you will find plenty of local dishes containing mussels, but moules à la crème is one of the most famous, featuring two of Normandy’s most loved ingredients: mussels and cream. It’s possible to make moules à la crème with any type of mussel, but in Normandy one would typically use moules de bouchot. This type of mussel comes only from the Mont Saint-Michel Bay, which has Protected Designation of Origin status from the European Commission, guaranteeing it is from a particular region and is farmed with a recognized savoir faire. The mussels are very small, with a bright yellow or orange flesh, and have a very distinct flavor when compared to other types of mussels. 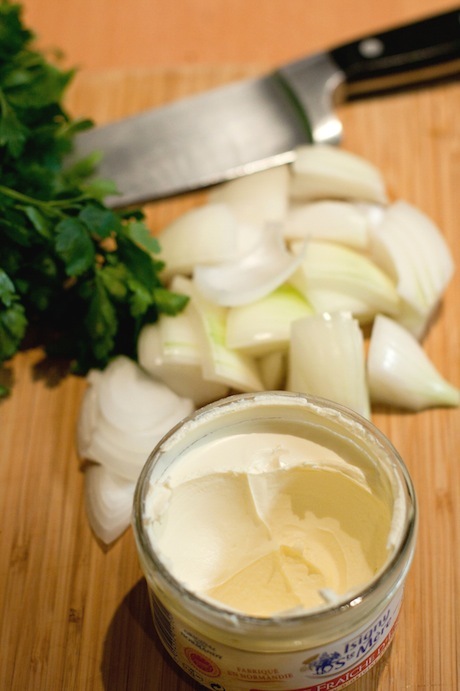 Crème fraîche from Normandy is thick and rich, and some of the best types come from Isigny-sur-Mer in Calvados (which also holds Protected Designation of Origin status). This is a celebrated dairy region, well known for the quality of its butter as well as cheeses such as Camembert and Pont-l’Evêque. Moules à la crème is the perfect example of regional cooking using only the finest of regional ingredients, but it is also extremely easy to make: you can place a steaming pot of mussels on the table in 15 minutes. Push up your sleeves and eat with your fingers, armed with an empty shell to help dig out the next mussel and some crusty bread for mopping up the sauce. Just make sure to serve it with a few glasses of cider to make it a truly authentic Norman experience! 1. Scrub and debeard the mussels (see link below for a tutorial). 2. 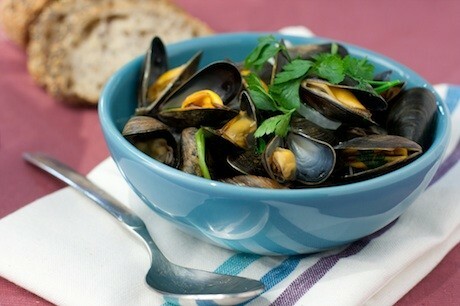 Place all the mussels in a large pot, add the wine and sprinkle the onion and parsley over the top. 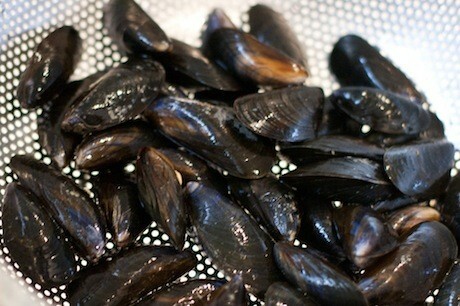 Stir, cover and steam on medium heat for 4 to 5 minutes, until the mussels have opened (the amount of time will depend on the size of the mussels). 3. Add the cream, sprinkle with black pepper and stir gently, then garnish with remaining parsley. Serve immediately by placing the entire pot in the middle of the table, family-style, with crusty bread for mopping up the delicious sauce.